Wystan Hugh Auden, known more commonly as W. H. Auden, (February 21, 1907 – September 29, 1973) was an English poet and one of the most influential poets of the twentieth century. Younger than William Butler Yeats and T.S. Eliot, the two titans who had dominated English turn-of-the-century verse, Auden assimilated the techniques of these and the other modernists, becoming a master of poetry that was both rigorously formal and radically new. Auden was a poet of prodigious talent and output, living at a time of immense transition both in the world at large and in the poetic scene in particular. During the decades in which he lived, the ambitious, Modern poetry of Ezra Pound, Eliot, and Yeats would give way to a flood of contemporary poetic schools—from the Confessionalism of Robert Lowell to the formalism of Philip Larkin to the postmodernism of John Ashbery—all of which have competed for dominance in poetry ever since. Auden lived right at the center of this major sea-change in poetic development; his double-life as a British and American citizen only heightened his impact on the Anglophone world; and his influence, both as a beacon of poetry's traditional past and a harbinger of its radical future, is virtually unmatched by any other twentieth-century poet. He lived a double-life in another sense: His interests changed dramatically, as he turned from his early political orientation to a more inward focus as a result of a religious epiphany. Like Robert Frost, Auden was one of the last great poets who possessed a thorough mastery of form. Legend has it that Auden's friends would often ask him, on a dare, to compose a poem on a particular subject, with all sorts of ridiculous formal constraints (it must be in trochaic pentameter; it must be written in the form of a sixteenth century sestina; the second line must end with "chicken") and not only would Auden have the poem ready in 24 hours, but, more often than not, it would be a quality poem. Wystan Hugh Auden was born in York and spent his early childhood in Harborne, Birmingham, where his father, Dr. George Auden, was the school medical officer for Birmingham and Professor of Public Health at the University of Birmingham. From the age of eight Auden was sent away to boarding schools, first to St. Edmund's School in Surrey, and later to Gresham's School in Norfolk, but he returned to Birmingham for the holidays. He was educated at Christ Church, Oxford University, but took only a third-class degree. After Oxford his parents offered to him the chance to spend a year abroad. Auden chose Berlin, opting for Germany over the more fashionable Paris, and his time spent there would fill him with a love of the German language that would extend its influence into his poetry. On returning to England, he taught at two boys' schools from 1930 to 1935. In 1935 Auden made a marriage of convenience to Erika Mann, daughter of the great German novelist Thomas Mann, in order to provide her with a British passport to escape the Third Reich. Although the couple never lived together, they remained friends and never bothered to divorce. 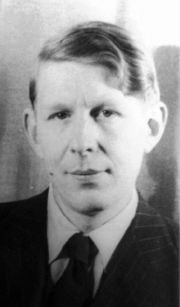 During this time in Britain, Auden began his poetic career in earnest, quickly becoming a major rising star on the literary scene; in particular he gained fame by writing a number of poems and plays warning of the dangers of totalitarianism, which won him great acclaim among British critics and poets. Among the most important products of this early period of Auden's career are the plays written with his friend Christopher Isherwood The Dog Beneath the Skin (1935), The Ascent of F6 (1936), and On the Frontier (1938), which were staged by an experimental theater company to which Auden belonged. All of Auden's work during this phase of his career is marked by his political activism, and one of the most harrowing poems ever written on a political theme, "Epitaph of a Tyrant", closes with a description of tyranny in two haunting lines: "When he laughed, respectable senators burst with laughter / And when he cried the little children died in the streets." In addition to poetry and plays, Auden was also prolific during this period as a letter-writer and essayist, producing a work of lyrical journalism Letters from Iceland, (1937) and another piece on the war in China entitled Journey to a War (1939). While traveling to and from China, Auden and Christopher Isherwood crossed through the United States, and in 1939 Auden decided to move to America permanently. This move away from England, just as the Second World War was starting, was seen by many as a betrayal by the political writers who had supported him earlier, and his poetic reputation suffered briefly as a result. Soon after arriving in New York, he gave a public reading with Isherwood and Louis MacNeice. Having spent the war years in the United States, Auden became a naturalized citizen in 1946, but returned to Europe during the summers starting in 1948, first to Italy then to Austria. From 1956 to 1961, Auden was Professor of Poetry at Oxford University, a post that required him to give only three lectures each year, so he spent only a few weeks at Oxford during his professorship. During the last year of his life he moved back from New York to Oxford, and he died in Vienna in 1973. He was buried near his summer home in Kirchstetten, Austria. 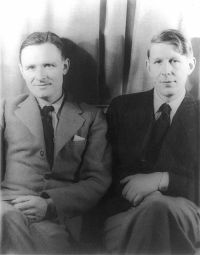 Auden wrote a considerable body of criticism and essays as well as co-authoring some drama with his friend Christopher Isherwood, but he is primarily known as a poet. Auden's work is characterized by exceptional variety, ranging from such rigorous traditional forms as the villanelle to original yet intricate forms. Auden displayed remarkable technical and verbal skills regardless of form. He was also partly responsible for re-introducing Anglo-Saxon accentual meter to English poetry. Auden was one of the most prolific writers of his time, and his output of both poetry and prose is enormous. Through this vast quantity of produced work, a number of various themes can be seen emerging in Auden's oeuvre. Auden always saw himself as a northerner and had a lifelong allegiance to the high limestone moorland of the North Pennines in County Durham, Northumberland and Cumbria, in particular an allegiance with the poignant remains of the once-thriving lead mining industry emerges as a major theme in his verse. Auden called the North Pennines his “Mutterland” and his “great good place.” He first went north (to Rookhope, County Durham) in 1919 and the Pennine landscapes excited a visionary intensity in the twelve-year-old Wystan worthy of William Wordsworth; it was on this trip that Auden experienced the epiphany that led him to become an artist, when he idly dropped a pebble down a well. Auden had been raised in a predominantly scientific, not literary, household, and as a young man at Oxford he had intended initially to become a mining engineer. Auden's interest in the mining country of England and frequent preoccupation with it in his poetry is a sign not only of Auden's Wordsworthian love of untamed nature, but also of a deeply scientific bent in his own personality which surfaced throughout his works as he constantly sought some degree of certainty in the rapidly changing world. Ultimately, Auden's scientific, moralizing self would find its highest form in the homiletic religious poetry that he composed near the end of his life. Poems which most explicitly address the North Pennines aspect of Auden's career include "New Year Letter" (1940); "The Age of Anxiety" (1947); and "Prologue at Sixty" (1967). Before Auden turned to Anglicanism, he took an active interest in left-wing political controversies of his day and some of his greatest work reflects these concerns, such as "Spain", a poem on the Spanish Civil War, and "September 1, 1939", on the outbreak of World War II. Other memorable works include his Christmas oratorio, For the Time Being, the poems "The Unknown Citizen," "Musée des Beaux-Arts," and poems on the deaths of William Butler Yeats and Sigmund Freud. Auden was often thought of as part of a group of like-minded writers including Edward Upward, Christopher Isherwood, Louis MacNeice (with whom he collaborated on Letters from Iceland in 1936), Cecil Day-Lewis, and Stephen Spender. Although never given a formal name, this group which wrote prolifically during the 1930's in Britain was one of the most influential movements in early twentieth-century English poetry, and was largely responsible for the furtherance of modernism in England as well as the alignment of poetry with politically active causes. Auden himself, however, stopped thinking of himself as part of any group after about the age of 24. Auden also collaborated closely with composers, writing an operetta libretto for Benjamin Britten, and, in collaboration with Chester Kallman, a libretto for Igor Stravinsky and two libretti for Hans Werner Henze. Auden was a frequent correspondent and longtime friend of J.R.R. Tolkien (although they rarely saw each other). He was among the most prominent early critics to praise The Lord of the Rings. Tolkien wrote in a 1971 letter, "I am... very deeply in Auden's debt in recent years. His support of me and interest in my work has been one of my chief encouragements. He gave me very good reviews, notices and letters from the beginning when it was by no means a popular thing to do. He was, in fact, sneered at for it." Auden's importance to his fellow artists and writers is in some degree comparable with that of Ezra Pound to an earlier generation. In addition to being a prolific poet and writer in his own right, Auden was also a prominent friend and correspondent with a number of the rising stars of his own times, including James Merill and Philip Larkin. His legacy as one of the most important poets of Modernism is indisputable, and he continues to be one of the major luminaries for poets writing today. All links retrieved January 25, 2016. History of "W. H. Auden"
This page was last modified on 27 January 2016, at 16:43.